We live in the city, so a trip to a pumpkin patch to choose the bestest most roundest pumpkin is an annual adventure requiring (apparently) rain boots and your pinkest polkadot pj bottoms. 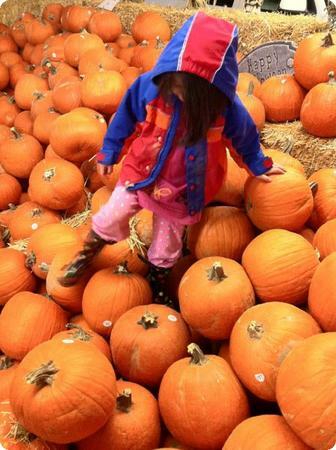 editor@familiesgotravel.com on October 26, 2012 at 7:14 a.m.
We love pumpkin picking, too. And rain boots are handy, not to mention stylish. Sonja on October 26, 2012 at 8:52 a.m.
My kids are too old for pumpkin patches now and that makes me sad. It was always one of my favorite seasonal activities. Kate on October 26, 2012 at 9:34 a.m.
Love that she went to the pumpkin patch in her PJ's! (or at least the bottoms) Which patch did you go to this year? Terumi Pong on October 26, 2012 at 9:47 a.m.
We have so many great pumpkin patches near Seattle too:) Which one did you guys go to? I love the giant pile of pumpkins! Danielle (Bubs on the Move) on October 27, 2012 at 9:06 p.m. I have vivid memories of visiting a pumpkin patch when I was a very small child on a visit to the USA. I really hope I get to take my own boys to one sometime in the future. tracksbnb on October 29, 2012 at 8:49 p.m.
Jason From Suitcase.me on October 30, 2012 at 7:15 p.m. Unfortunately we didn't go pumpkin picking this year. I might just buy a Christmas tree to make up for that. Those pumpkins are almost as big as she is! Wow! Jane @ Worldwide Vacation on November 3, 2012 at 1:50 a.m.
Pumpkins! These make me remember my time when I had to make a pumpkin lantern. I miss that time. Travel Equipment on November 5, 2012 at 1 a.m.
That's a lot of pumpkins. Halloween is over. What would you do with those? I think those aren't edible.